Forget to write this on previous notes.. gw bolak balik nonton youtube ini sama baca blognya Tristupe. Where was I? Ah, sister woke me up at 2 am, after dressing up I had (ngga lain dan ngga bukan) overnight oatmeal for light breakfast that I’d prepared night before. 2.45 sumthing, all trojans had gathered in lobby and off we go. 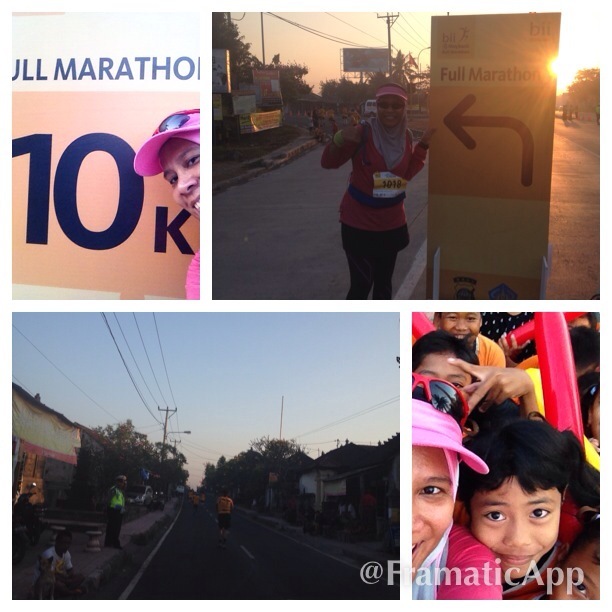 Arrive at the venue almost an hour later, met Amel my colleague who took her virgin 10K and met some familiar faces. Flag OFF for FM was at 5 am. Some of us decided to take sholat shubuh at around 5 based on aplikasi jadwal sholat on their phone, but i decided to have mine in Km 5 where the committee provided temporary mushola. Off we go to start line, Riyana and sister wished me good luck. riyana’s husband, Bona would take FM as well. 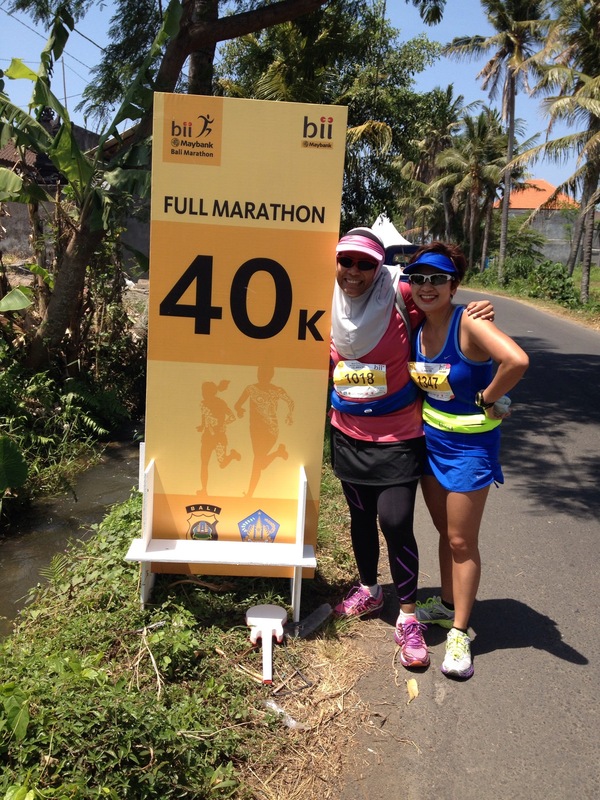 Owh, Kak Uchi and Diana yang kemaren2x mau ambil HM, last mins changed their mind join FM and ditch their HM bib. rangkayoooo beli bib sampe 2!!! My personal target is to finish this race before Cut Off Time, let it be 6:59:59 in one piece without dipapah or masuk ambulans. There went of the flag off, greet by Torch along the way. Syahdu gitu deh. As planned I ran with Diana. Here, I had my shubuh pray, Diana lanjut lari karena lagi nggak sholat. 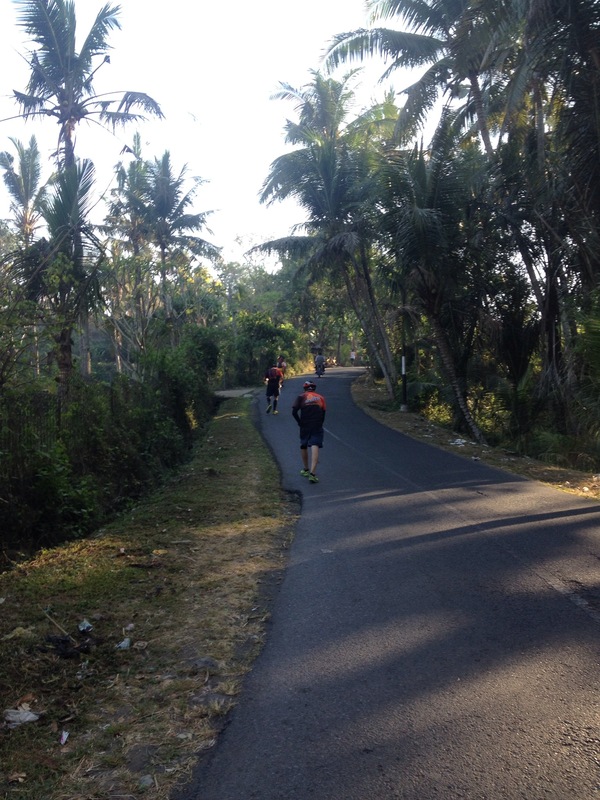 Then continue running with Paipo yang langsung melesat and Uchil. there was a U turn in Km 10. Meters before I saw pak aryo, kak oi and mami Vitri at the other side. 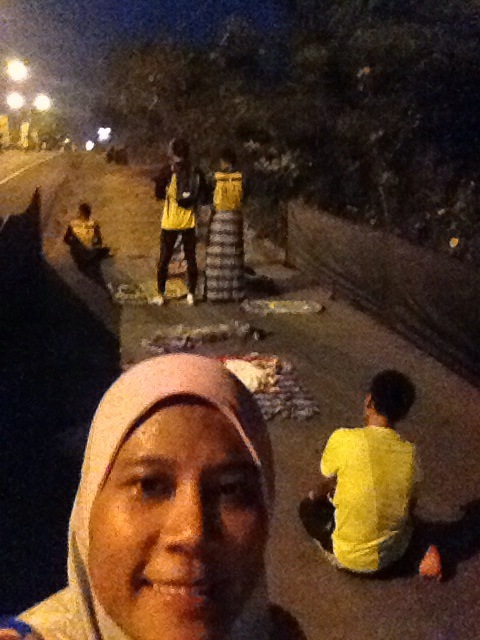 They cheered me up saying a u turn just around the corner…which is…yaaa masih jauh… Hahahahah. I think there was the first check point. Mr sun has rose, and as moderator said on that video many villagers came out the house and cheer us up. I took one salt stick. There were also elementary students line up at the side of the road holding banners and cheered us up. Not sure how many group of (these anak sekolah) along the course. there is still a group of students near Km 32. It was a teary moment, noticing these kids most likely to be Hindu. Very sweet of you kiddos, kalo ngga ingat badan bau ketek, really want to hug them all. Not just grup of students, there were also barong show or balinese traditional music-show along the course. I paused of course to take picture with them. Ganti-gantian aja sama peserta yang lain. At first, i wanted to imitate Ruthy, taking pictures on every mile marker. But considering I have to take 41 markers, i changed my mind and plan to take pictures in unique km. I took one in Km 14 as a signed that I’ve done one third of the race. garmin said it was below 2 hours. i think i was doing good, because on my practices 14km often took more than 2 hours. we were done in first loop, going back to main road again. There wes ambulance station, I asked them to have my leg sprayed. then turn left at about Km 18. Marked as second loop in FM course. with paddy field screnary, a mix between green and yellow paddy field with clear blue sky as the background. subhanallah! as announced in the video, there was sharp downhill on the way to Km 21…as a beginning of quite steep hill! Thanks to that latihan di Sentul. i walked, but not running out of breath. from the first turn at km 10, I made friend with Pak Bowo, a 54 yr old man who also had his first FM (in fact, this was his second race). His strategy was 2 mins run and 1 min walk. Sometimes I passed him, many times he passed me 😀 We met again on that steep hill. “Saya kira kamu udah duluan” he said. “Ngaso dulu pak, minum kopi” I answered asal-asalan :p. I took pic on Km 21 marker to mark a half way done. I even posted pictures that I had took to FB. *banci socmed ya kakak? 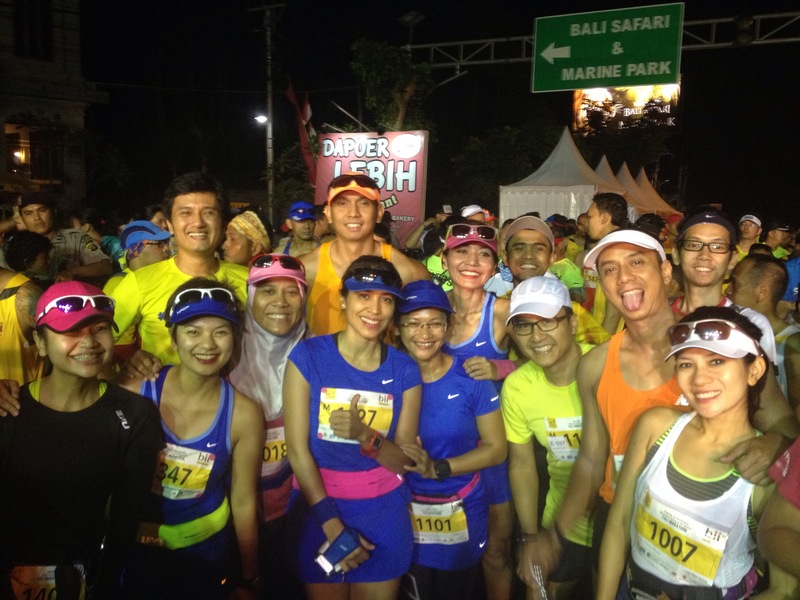 * I talked to other participant from Tanggerang Crazy Runners who lives in Rempoa. “Ini gw diracunin nih sama anak2x TCR, tadinya niat HM” . Bahahhahaha sama aja tiap komunitas. Heading to the main road again in Km 23, had less than 1 km in main road we made a left hilly and there were the Km 24. This is the last loop. Then I stopped at Km 25. Finally! Nature calls! Unfortunately there was no toilet around. Ini sih minus point race ini. Di Km 19-Km 21 banyak toilet abis itu ngga ada. Besides that Km 25 is a house. Numpang di situ. May you notice the Balinese had separated rooms, jadi dapur, toilet dan gudang misalnya terpisah dari main building. At KM 26-27 balai desa kosong. It was in Desa Pering “gee, gw lelet sih ya. Mereka udah merapihkan properties. The HM also run this route, but they went straight, The FM route made a left turn. There was also medic station I felt a slight yet noticeable cramp in my right calf. So I asked for spray, unfortunately they don’t have it. A note for my next- ntah kapan- FM to bring your own spray. I took pictures with KM 28, as a marked that I’d complete 2/3 of the course. Haleluyaaa….i saw pak haji in one of warung. Mampir hore! We made a right turn afterward I saw ” warung babi guling” #penting :D. Saw a small store selling bedcover rasa ingin mampir. 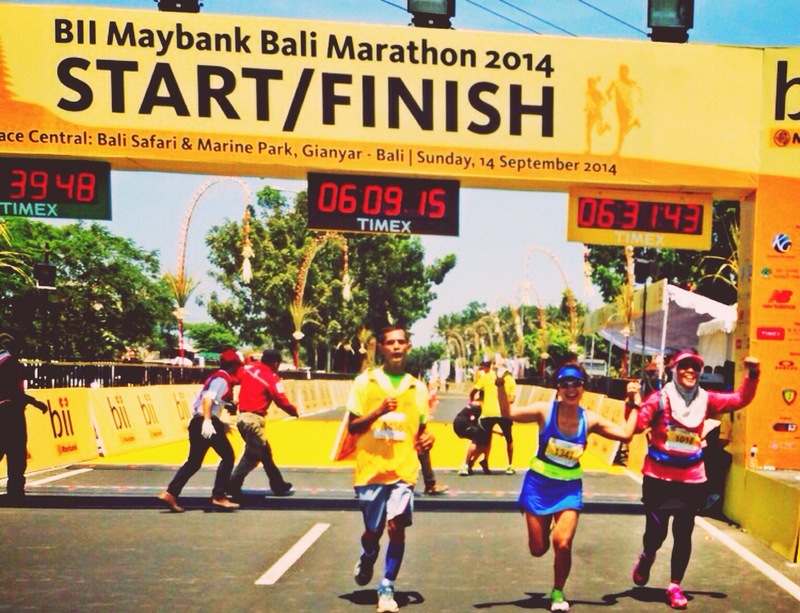 It was about 10 am, meters before Km 30, I saw a sight of blue attire petite woman. Ah, that’s Diana! We meet again! There were water station and banana station in Km 30. I paused to enjoy banana, which is…masih keras belum matang :((. Also had my right calf sprayed dipinjamin group of TCR. Make a right turn after KM 30, I walked most of the time. It is Bali which lays in the equator. Hot and humid. Me and Diana took pic in Km 31 marker and I – being banci socmed- seluruh-dunia-harus-tahu-I-am posted in my FB timeline. My longest run was 31km before the race. Anyway, I walked most of the time, pak haji had passed me. With pura and houses in both side. After that we run in Desa Bona with paddy field on both side. No shades. I paused to do some stretching. The cramp at right calf was uncomfortable. But much better from my last HM where I barely walk. It would be a slap on the face since i told them not to easily give up. So, back to initial plan to finish this race in one piece before COT! iIt was Km 35, like previous water stations, they were lack of mineral water while I wanted to wash my face to get rid of this sand. The volunteer gave me ice pack instead and i used the ice cubes to wash my face and eyes. I even chewing them. sugar, perut gw kembung minum pocari terus!!! Anyway, during the race I only had 2 dates and 1 soy joy. Gu Gel provided from race pack for FM categories, but I left it home. Anyway, I notice there were almost no Indomart and Alfa Mart along the course. I think it’s good. Let those giant retail spreading in tourism spot or big cities only. at about Km 38, I passed pak haji with his cramped leg. He walk most of the time afterwards. Owh, i had my leg sprayed by medic staffs. Finally! Last water station provide banana as well. I took it, but keep it in my backpack. Not really hungry at that time. as I was approaching Km 40 and wanted to take pictures with the marker, I had miscalled from Pak Hasbi. Probably checking my whereabout. 2km to go my man! Diana still look stunning with her mega red waterproof lipstick! She had her own hallmark moment at this point. Considering lack of practice, switch to FM at last mins, would shortly to nail her first FM in few minutes ! 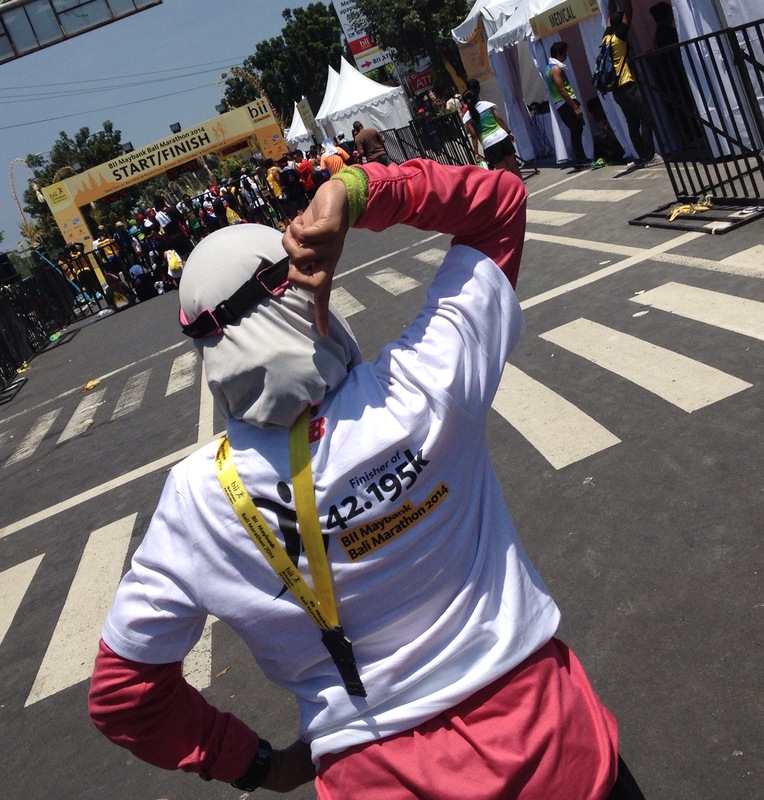 She just had half marathon a week before at Bromo Marathon. Jelmaan alien emang. What an endurance! “Di, loe bawa lipstick merah lo ngga? She couldn’t stop giggling and actually I forgot that I asked such a silly question. final turn, going back to main road again. We discussing a pose when we cross the finishing mat! penting juga ini!!!! 500 m before finish line, holding hand as promised, 22 minutes before COT, we cross finish line!!!! With my kids at finish line! kak uchi hugged me right away and cried, padahal gw ngga nangis lho *pencitraan* :p The volunteer asked me to grab medals as i blocked the line! duuhhhh ampe ngembeng mata gw mbacanya; tersirat dg kental nyawa dr tulisan lo ini.